In a mixing bowl, beat together the eggs, sugar, oil and pumpkin.Sift together the flour, baking powder, salt, baking soda, salt and cinnamon; add to wet ingredients and mix thoroughly. Spread into prepared pan.Bake at 350° for 25 to 30 minutes.Remove from oven and allow to cool. For the frosting: beat together the cream cheese, butter and confectioner's sugar.Evenly spread over bars after they have cooled. 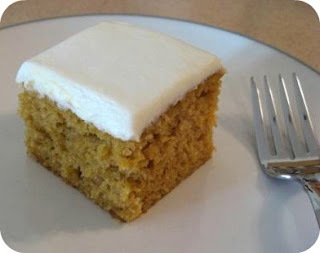 Mmm...just in time for an I-feel-like-baking-something-pumpkiny sort of day! I added cinnamon to the cream cheese icing as well; sooooo yummy!